Printed in full colour on a quality 150gsm gloss paper, this is the option if you want a longer run of flyers. 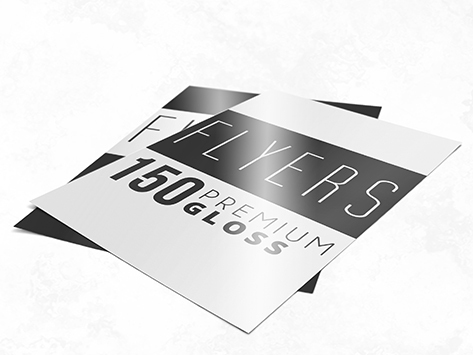 Just like our Short Run option, these flyers are always delivered flat - if you wanted a folded flyer you need to check out our "Brochure" products. The first (and best) place to start is to think about your flyer from the point of view of the person receiving it. You don't matter, your potential customer does. This means that your logo and your company name in big writing is not important. Nor is your phone number or email, for that matter. Those elements are important to you, not your customers. Have a think about what your customers want to hear. Use plain language, talking to the everyday person on the street who may not know anything about your industry. Then move onto your headline. This is the most important thing you will print on your flyer. Does it immediately grab the recipient's attention and makes them want to read on and find out more? Nearly everyone will read your headline. Not many read on, so your headline is the one chance to grab attention and grab some more sales from your flyer. Once again, your business name and your phone number are not a headline - think up something that draws people in - Key words like "Top Secret", "Top 10", and most importantly "Free". Now think about your photos and images. Remember our flyers come with full colour printing so don't hold back on the photos and graphics! Sometimes a photo of you can work, especially if you're in an industry where a personal connection really counts. But it might a photo of anything at all - just try to think "what will my customer see?" when they look at this - will it make sense and will they instantly know what you are selling? If your potential customer can't tell in just an instant, after looking at your flyer, what you're selling, what product or service is, then the design will not work. Once you spend money on printing and distribution, you'll be mad not to print on the back of the flyer as well. Use the back for a really great offer, or extra details on you and your products. There can be an offer on the front too. Spending money on a flyer without a super good offer is just pointless. Every business needs to come up with the right offer, something that doesn't cost you a lot of money, but still your potential customer thinks they're getting something great without spending a lot of money. The best option is something free - we all love free things. Then once the offer is right, add in a deadline. Make them act now, and add the perception of scarcity and your response rate will increase dramatically. Now use the flyer to include some extra information on your products and services. Usually it won't be long paragraphs of writing (although it might be - when it's written well (really, really well) long copy sells better than anything else). But usually stick to bullet points, focusing on the benefits of the product or service, not the features. So there's a super quick checklist for you to make a great flyer - Attention Grabbing Headline, Relevant and quality images; an offer that's hard to refuse; a deadline to encourage action; additional information on your business, your products and services. Need a hand? Just email us today for more options to promote your business.